I’m still disproportionately excited about meeting up with Amanda last week for a study session. We had a really great catch up and then got a couple of decent hours of work in. Maybe not the most productive work session in my life but definitely one of the most productive for me in a while. It saddens me a bit to say that equals to sitting down in one stretch and writing 1000 words for my phd and reading one submission with care. But then, that’s also probably almost all the work I’ve done since then. The bub is pretty good in a cafe, much better than at home where she seems to need a lot more entertaining. She might be a bit more of a socialite than me in that regard! I figure leaving the house with her is going to be the best bet for me in getting work done over the next little while. So I’m going to keep track of the places that work and those that don’t. What do you look for in a cafe? Any suggestions for places in Perth to get a good cup of coffee AND to work in? My first suggestion was the Waldecks cafe in Karrinyup, mostly cause it has such a nice setting out on the decking with very cool cane couches and the vista of their plants for sale. 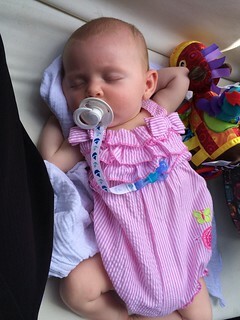 We went on that very hot day last week and it did have a light breeze that took the edge off some of the time. Large comfy couches and tables outside and large tables inside to spread out and work on. Pretty setting to stare at whilst thinking. Reasonable access for a pram. Lots of space to put babies down (see photo). Service is not awesome (twice I’ve been there, twice it’s not been good). Hot on a really hot day. Even though the pros outnumber the cons, I’m still a bit meh about this cafe. Free wifi and lots of space are pretty appealling. I’d have drunk more cups of coffee if the staff had offered me or if when I asked to order another, I wasn’t sent to the front counter to do so. Posting again after a longer silence than I intended. I had meant to post every day as a way of checking in with the world and also to mark progress on this long project of mine. But life has a way of not ending up the way you thought it would, doesn’t it? And in truth, between you and me, I feel like I might have wasted the day. Which comes to the title of this post – expectations. I think I’ve probably always lived my life trying to meet someone’s expectations, whether they be mine or other people’s. I remember getting my very first report card in Grade 1. My mother was standing with a cousin and they were comparing my report card and my cousin’s (I had about 5 cousins in my class, small community). He had got As and I hadn’t. And up until that very moment, I didn’t know I was supposed to, or that we would be graded and that the grades would *count*. And I remember thinking, “Why didn’t I know this?” And for years looking back on that moment of feeling completely behind the 8 ball, and inadequate, I’m still not sure how you are meant to know that life is going to be filled with marks and assessments and *judging* unless someone tells you. I still remember vividly being 6 years old and feeling completely inadequate and not good enough. (And I’m sure the grades were of things like handwriting and colouring in). That moment kind of taught me that life was going to be a race and that people were going to scrutinise you and compare you to others. And that seems pretty harsh and stressful, sure. But I went to a high achieving school with over achievers. If I’d not had a competitive streak in me (and maybe that Grade 1 report card lit that spark for me), I would have drowned in that school. Others did, and I felt sorry for them at the time. But for me, I think otherwise, I would have been lazy and sat at average. Instead, I was up there competing and pushing and striving to be the best. I never was though. Fourth was the slot for me and I had to slog away and work my arse off to maintain it. In high school, we ended up in much much smaller classes and I might have topped Calculus on a good day (but there were only two of us in the class anyhow). But the pushing to be the best got me an engineering degree. And even though I was probably only average or just above class average in my degree, without that expectation to perform, and without constantly measuring up, I don’t think I would have passed. As I said, I have the tendency to be lazy. I started TPP as an experiment, really. I wanted to see if I could implement some of the ideas that I had through ASIM. 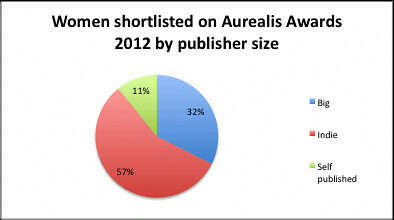 And I wanted to see if a small press *could* be financially viable. 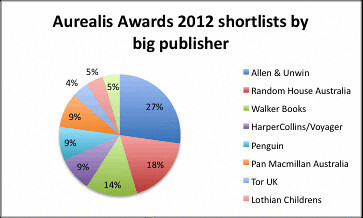 I’m still seeing if a small press can be viable – I don’t consider TPP to be established enough yet as a business to really be able to test it (longevity, credibility, reliability, consistency, backlist and relationships and networks take time to develop) and I’m still learning so much about publishing. 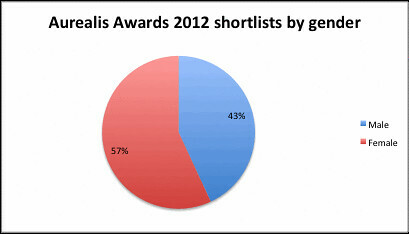 But one of the people who lit a spark in me to be competitive was Paul Haines. We were at a room party at a Convergence and he said to me, “Yeah GJ, what you’ve done is good and all, but you’ll burn out soon enough, like they all do.” And I looked at him and I said, “No I won’t.” And he said, “We’ll see.” And any time I’ve felt down or tired or like I could burnout or throw the towel in, I’ve remembered that conversation and thought, “I’m going to prove to him that I can do this.” And I still will. I’m lucky to have found people in this community of ours who believe in me and support me and help make this dream a reality but also know how to push my buttons. Some people push them the wrong way but a lot more of them know how to push them to help me achieve more and better than I would have done if left to my own devices. And I’m really grateful to those people – who pick me up when I am down and push me on when I need the push. And sometimes the people who push you aren’t doing it with love. But without them, too, I’d be less. But what happens when you aren’t in a classroom anymore or in a workplace where promotion is the thing you’re working on? I work from home now, by myself, on a project I am mostly in charge of myself including the direction, the point, and ultimately how my performance will be graded. I don’t have anyone to mark myself against. And having done this before, albeit that time I did it on campus so I had a lot of people around me to mark my expected progress over time etc, I know that a PhD is essentially a solitary endeavour and can be very confronting. The whole point of it is to come out the other side which then, after doing it, justifies and makes meaning out of the journey. In some ways, the answer is that there is no real difference to what I was doing with TPP on my own – setting my own expectations, devising milestones and marking progress along the way. I guess, though, the trouble with me (and isn’t there always) is that I can actually go either way – be lazy or set unrealistic expectations. And there’s that word again. Because somehow, I think that because I am now working on this full time, I must therefore achieve exponentially more than I was before, whilst also taking off my weekends. And now on top of that, I’ve suddenly, in my second trimester, developed the need to sleep 10 hours a day, every day. I have NEVER slept that much before. I’m a 6 to 7 hour a night person with 1 day in the week of maybe 8 or 9, and I’m good. This sleeping so much feels … wasteful, I guess? Even though, if I don’t do it, I feel physically ill, and I can intellectually understand that my body needs the rest, what with all that multitasking of growing inner ears (we did that last week) and fingerprints (or whatever it is this week). I’m just really scared that I will squander this opportunity I have here. It feels like such a huge gift and I want to make sure that I exhaust every aspect of it and put it to good use. And then I “sleep in” and work more slowly and feel sluggish a lot. It … comes back to expectations. I know. 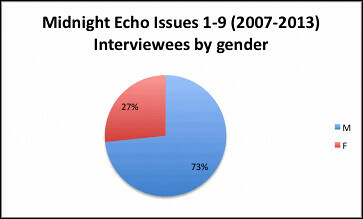 Today’s statistics are for Midnight Echo. The editorship is a rotating one. 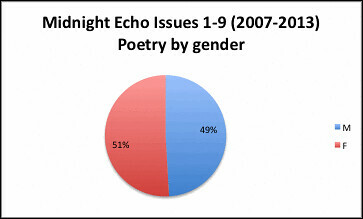 Only the first two issues had female co-editors. 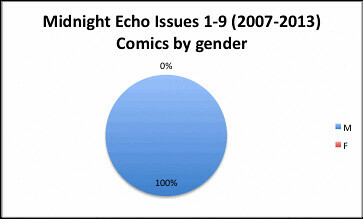 Since Issue 2, no woman has been at the helm of Midnight Echo. The magazine has never been solely edited by a woman. In contrast, five issues have been solely edited by men. 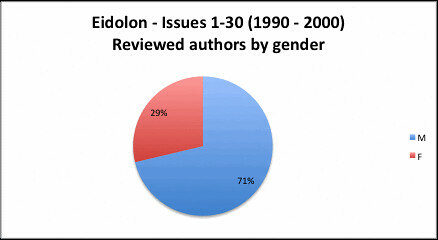 The average gender breakdown for the two issues coedited by women is 24% female authors to 76% male authors. 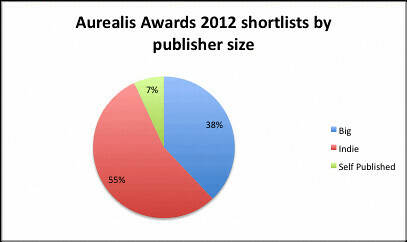 As well as looking at awards stats, I’m also looking at the publishing stats, to place one in the context of the other. Additionally, I’m going to be looking specifically at some case studies as I move further into my PhD. 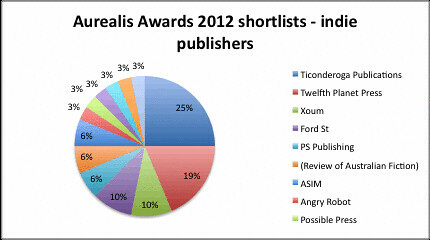 Likely those won’t be Australian presses but the Australian context is within which Twelfth Planet Press sits. Today’s data then is for Eidolon and Potato Monkey. Eidolon is for you if you are interested in encouraging the development of new writers, if you are passionate about your views on speculative fiction in any media and if you enjoy discussing all of this and more. In short, Eidolon is for people who care about speculative fiction and all its off-shoots. We are committed to promoting the idea of the “pro-fan”; a person who has a love for some aspect of speculative fiction, be it literary, cinematic, game-related or some other facet, and who strives to extend the boundaries of his perception of that passion; a person who seeks to create, to contribute and to objectively discuss. Eidolon featured fiction, non fiction, interviews, reviews, artwork and letters from their readers. I thoroughly enjoyed getting absorbed in the discussions in the letters and through these discovered the editorial for Issue 12 which addresses concern over the apparent gender bias in their published fiction. Issue 24 (1997) was a Special Women’s Issue. I would have been interested to compare the gender breakdown pre- and post- this issue but Eidolon closed four volumes later, in 2000 with Issue 30. 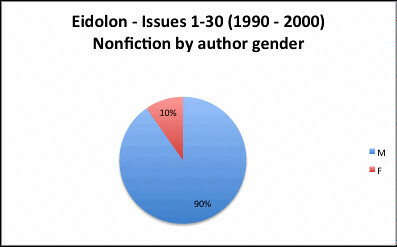 Nine issues had all male fiction ToCs. 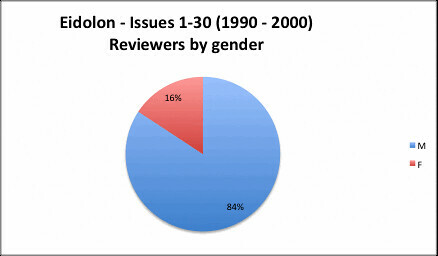 None occurred after the special issue. Potato Monkey was edited and published by Ben Payne. It ran for five issues from 2001 to 2007 and featured fiction only. Of the five issues, issue 5 consisted only of fiction written by men. Apart from issue 1, all the cover art was created by women. 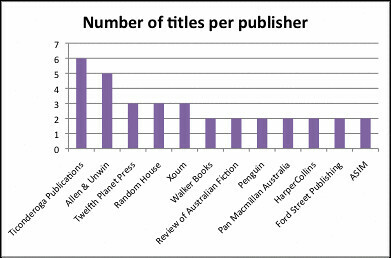 I’m also interested in looking at trends and changes in the publishing industry so the following graphs look at which publishers have what proportion of the shortlists – divided roughly into big publishers and indie; and also number of titles per publisher shortlisted. I spent my birthday at postgrad orientation day. I was intending my birthday to be really low key but it ended up being one of my favourite ones so far. I met Helen at the train station and headed into uni with her where we had a long good catchup chat over breakfast before she escorted me to the lecture theatre where I would be spending the morning. I was determined to sit by myself, engage with noone, and focus on getting the information I need. As far as I was concerned, I wasn’t there to make friends or slide into “university life” – I’ve done all that before, the first time round, and am well aware of how much that gets in the way. So what happens? Someone sits next to me, and we get talking, and the next thing I’m doing is sending him to a TED talk that I think will be useful for his PhD topic. And some other people sit down near us. And we have to do that forced group interaction thing and I find out all three of them are doing PhDs in sustainability and planning and I realise that I have not run very far away from where I was at all! But the day was super useful. I’m not sure how long it’d been since I’d been so intellectually stimulated – I had that complete drained exhaustion when I came home at the end of the day, like after a really hard exam. And I’d gotten a really good idea of what is required for the candidacy proposal I now have 6 months to write. And where to start on that. And some more thoughts on troubleshooting my topic and guiding where I might want that to go. All that stuff. Sitting there in the workshop, I realised how excited I felt – I had that feeling you get, you know, when you fall in love or you win at something you’ve been working really hard at – elation, excitement … HAPPINESS. What an awesome birthday present to get – Helen spent quite some time lobbying me to even consider a PhD and helped me so intensely with my application. And there were moments where tears threatened at the back of my eyes, I was so overwhelmed at how lucky and excited I am to be able to spend the next 3-4 years on something I love so much. And how much I don’t want to waste any opportunities. It’s a very strange feeling to be changing career tracks. And something I’ve been wrestling with for a while. I’ve been passionate about the environment since I was 14 or 15. When I first learned about global warming, and the large mammals under threat of extinction (elephants, cats and rhinos) and then the Biodiversity Act in Rio, I knew I wanted to work towards conservation. To making a *difference*. I was driven to act. I didn’t want to be on the sidelines watching the deterioration of the environment without at least trying to do something. And then my physics teacher found me a new degree at UWA – environmental engineering – which seemed to fit the bill. And that’s been my thing, what defined me, for a very long time. It’s not that I feel like I’m betraying that. Well not necessarily. But I have been thinking about whether it feels like I’m giving in, or turning my back or … maybe it’s just that I’m sad to be moving on? Like, there’s nothing wrong with one door opening when one closes, but it’s still sad to be closing the room behind that door. It’s not like I can’t still be active in conservation – there’s lots of other ways to work for a good cause. And it’s also not unheard of to get burned out when your day job is something you’re passionate about but you very rarely get to win. And sure, part of my job was to fight the fight, if only for public record. I did have some small wins and worked towards one or two larger ones, and I have left some legacies by way of tiny tweaks to larger policies. But in all, I’m pretty jaded and cynical and some other stuff that’s mostly political and not for this medium. I shouldn’t really be there any more. When I sat in that lecture theatre and later in the morning tea break talking to the other students about their PhDs in sustainability and I listened to their enthusiasm and passion to change the way things are, I wondered if I was doing the right thing? I wondered if this was some kind of cosmic sign about what I should be doing? I felt guilty, I guess. I actually mulled it over for a while, until I realised that it *was* a sign, it was very *pointed* sign. That it was ok to hand over the baton to someone else, someone with the energy and enthusiasm to carry it the next round. And that in what I am doing now, I feel like I make a difference.